Diane Fitzgerald has been very prolific this year, and each volume has been better than the last! 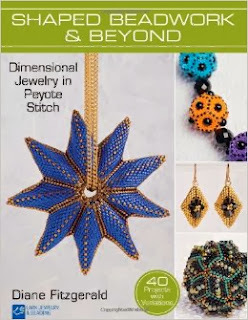 My previous favorite is Shaped Beadwork, so I was thrilled to receive the new Shaped Beadwork and Beyond, published by Lark Books. Forty new projects, not to mention variations too numerous to even count. Diane again focuses on three-dimensional geometric peyote stitched shapes, taking basic shapes introduced in book one in lots of exciting new directions. No matter how complex the projects seem, they are made up from component parts that are clearly illustrated and explained. After a chapter on the basics, Diane covers triangles, teardrops, beaded beads, bezels, pointed ovals, and concludes with a chapter full of miscellaneous three-dimensional projects for good measure!